Third-party store uploading Android apps to BlackBerry App World without developers permission? The long awaited OS 2.0 update for the BlackBerry Playbook brought with it a whole host of opportunities for new apps. Now that repackaged Android applications are compatible with the PlayBook, and being accepted into BlackBerry App World, some well known names are starting to appear in the listings. One such name is Dolphin Browser HD. A highly respected Android replacement browser appearing on the BlackBerry Playbook. Impressive. 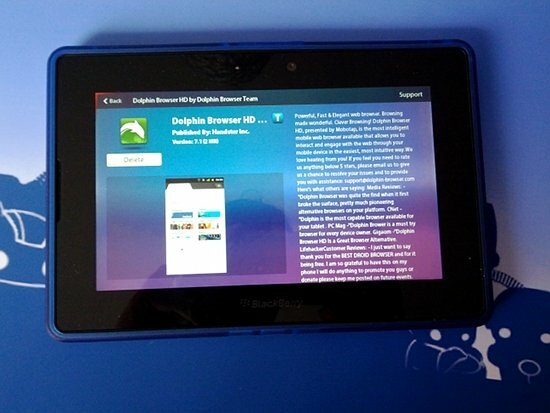 Despite being a phone browser, Dolphin is absolutely superb on the PlayBook and many already prefer it to the stock browser. Quickly -- although not surprisingly -- it has become one of the top 25 free apps in the App World catalogue. Everything is rosy then yes? Well, no, not quite. The submission to App World wasn't made by MoboTap, the developers of Dolphin. The submission was made by Handster, a third party store owned by Opera. Someone else doing the work on the behalf of the developers -- a win surely? Turns out MoboTap were blissfully unaware that Handster had repackaged and submitted Dolphin to the App World for approval. Handster had already put out a statement prior to the OS 2.0 launch that they were to be uploading apps on behalf of developers. A spokesman for MoboTap told Engadget that; "We do not condone Handster submitting our Dolphin Browser app to BlackBerry's App World for us and are currently working to take it down and assure Handster will not submit our app for us again. We will assess developing for BlackBerry when the time is right." Even though Dolphin is a free application in the Android Market, the question still remains over why Handster are submitting an application to BlackBerry App World without permission. A quick search finds a pretty big selection of apps that Handster have submitted -- albeit a lot of them aren't that good -- including paid applications. In any case, it seems that MoboTap are doing everything they can to remove Dolphin Browser HD from App World. Questions have been raised, but more importantly we're hoping that there aren't any Android developers being taken advantage of.